Robin Williams was a superstar in movies, on television and at comedy clubs. But some of his biggest laughs came at military bases. Members of the armed forces have long held special affection for Williams, who died Monday at age 63 after he hanged himself in his San Francisco Bay Area home. Williams never served in the military, but he was a tireless participant in USO shows and also played real-life Air Force sergeant and disc jockey Adrian Cronauer in the 1987 film "Good Morning, Vietnam." Elizabeth O'Herrin, discharged honorably from the Wisconsin Air National Guard in 2008, said that Williams was "sweating profusely" when he performed in front of her and others at a 2004 USO show in Doha, Qatar, but he never seemed to tire. "I remember some of the jokes being borderline inappropriate, but we got the chance to cut loose a little bit and roll with it. Afterward, I got to meet him. I took a picture with him and shook his hand. He engaged with all the troops, gave them big hugs and big handshakes." "He shook every hand, signed every autograph, and hugged every person," the USO said in a statement Tuesday. "He understood the energizing effect laughter has in times of stress and he channeled his incredible energy to help those experiencing the loneliness, fear and uncertainty of being far from home and loved ones the chance to relax and recharge." 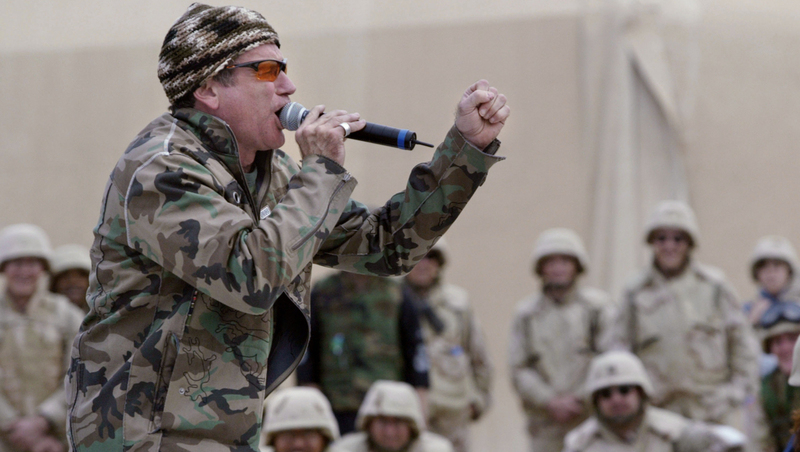 Videos of Williams' USO performances proliferated online after his death was reported, along with numerous tributes from veterans, including some who on the USO Facebook page posted selfies they had taken with Williams. Sales for the "Good Morning Vietnam" DVD jumped on Amazon.com, and the video was out of stock as of midday Tuesday. "I remember we talked how much the shows meant to us, and how much fun they were and how gratifying," said Sen. Al Franken of Minnesota, a former USO entertainer (his tour schedule was roughly two weeks behind Williams') and a friend of Williams, dating back to his years as a writer for "Saturday Night Live." According to the USO, Williams began working with the organization in 2002 and was part of six USO tours, most recently in 2010. He performed in 13 countries, including Iraq, Afghanistan, Kuwait and Turkey, and entertained more than 89,000 servicemen and women. "Good morning, Afghanistan!" he called out in 2002 at the Bagram Air Base. "I had a lovely military flight, thank you," Williams continued. "I love spiraling in -- nothing like that to make your colon go, 'Fire in the hole!' "
John Hanson, a senior vice president at the USO, was a press liaison in 2007 when Williams returned to Afghanistan. He remembered waiting with Williams on a plane in Kabul when they were greeted by a soldier who was moving equipment. "He talked to Robin and thanked him for coming. The soldier hadn't come out to the show, so he paused for a moment, pulled off the Saint Christopher medal he had around his neck, gave it to Robin and said, 'This has protected me through three missions, so now I'm giving it to you,' " Hanson said. "And Robin sat there looking at it. And he took a large silver cross from around his neck and handed it to the soldier. It meant the world to the both of them."